H and M chambray shirt (similar here), Vintage leather A-line skirt (I love this one too), Fleur sunglasses c/o Quay Eyewear (also seen here), Elliot Lucca tote, Rings by Old Hollywood and Express, Lader watch c/o Larsson + Jennings, Kenneth Cole gladiator wedges. Shot by Isaac Lacey. Happy Friday everyone! Hope you have some fun plans coming up for the weekend. My own weekend got started early, as Isaac and I came out to Montauk last night in prep for a friend's wedding this evening. It's so nice to be out of the city again, and I can't wait to get dressed up this evening and party on the beach! Anyway, the snaps above were taken around the corner from me on Berry Street, in a small community garden that Isaac and I wandered into late one afternoon. The flowers were gorgeous and literally towering over me, and it all reminded me of the small, fragrant gardens in the East Village that I used to explore when I lived over there during my college days. 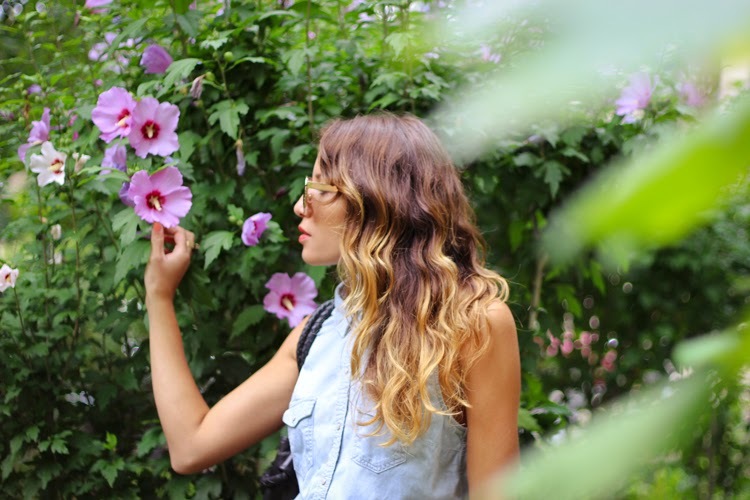 It's always such a nice surprise to stumble upon such a verdant oasis in the midst of NYC's concrete jungle, so of course we had to take some pics! Beautiful outfit! I love that leather skirt. The shape and that warm brown color are really nice. Love that leather skirt! Looks awesome styled with denim! Light denim and brown always look so amazing together, you've got this nailed! Awesome pictures! I love this outfit xo Especially the skirt and the shoes!